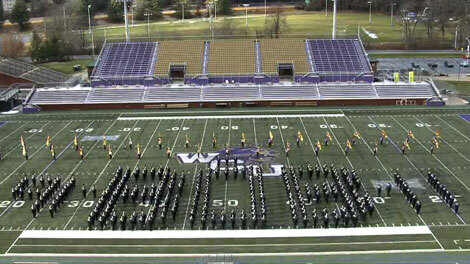 In 30-something degree temperatures on Friday, Dec. 17, the members of the Western Carolina University Pride of the Mountains Marching Band spelled 24 names on the field in two hours as part of a fundraiser. Photographs of the band in name formations, which honored band supporters who gave $1,000 or more toward the $640,000 cost of the trip, will be given to participating donors (whose gifts all together totaled about $60,000). The session lasted two hours, although it took 36 hours to chart the positions of each band member for the names, said director Bob Buckner. For the last photo, the students surprised director Bob Buckner by spelling his name “Bob” between the year he came to WCU (1991) and his last year at WCU (2011). Buckner told the band light-heartedly that was one name they had better spell right. A few photos from the morning’s event are posted on the WCU Flickr site.